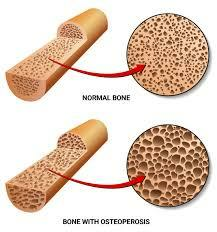 Osteoporosis is a disease that causes reduced bone density making your bones fragile and decreasing the bone strength. The bones of a person with osteoporosis becomes porous like a sponge and this may lead to multiple fractures even with minor injuries. Our bones are generally composed of calcium, proteins and collagens that render strength to the bones. These fractures can occur almost on any bone in the body. Cracking or collapsing fractures can occur. Spine, ribs, hip or wrists are areas that get fractured the most. Osteoporosis can silently make your bones hollow until a fracture occurs. Some fractured bones may escape detection for years without showing any symptoms. Slow and poor healing hip fractures. Osteoporosis can be controlled by making certain lifestyle changes like quitting smoke and alcohol, regular exercise, having a balanced diet with adequate amounts of certain nutrients like calcium and vitamin D. Take care while stepping into showers and baths. Take help of bath stools like Carex Adjustable Bath and Shower Seat and grab rails to resist falls. Use raised toilet seats like the Drive Two In One Locking Elevated Toilet Seat so as not to alleviate any pain in the knees or back. Postural supports like the Cybertech Ottobock Posture Dorso Direxa can help in resolving the hunched back problem due to vertebrae collapsing. OPTP Balls For Body Work may help in exercise and body massage. Always exercise carefully and do not try to take any kind of strains or it may result in stress fractures. Your doctor may provide prescription drugs for loss of bone density. At HPFY we bring to you a wide range of products that can lessen the discomfort caused due to osteoporosis. Buy Quality products at best prices with attractive discounts on each purchase at HPFY! What areas of the body does osteoporosis affect? What products help in osteoporosis?